May 12, 2012 - Sonex Aircraft announce that the first customer-built example of the new Onex single-place, folding-wing, aerobatic sport aircraft has taken flight! Bill Fisher of Jackson Tennessee flew his AeroVee powered, standard gear Onex, serial number ONX0018 for the first time on Thursday, May 10th. 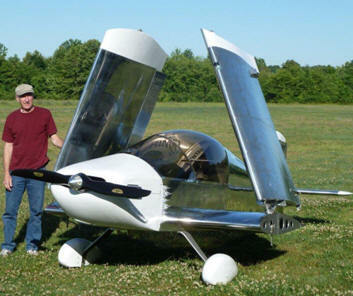 Bill received the fourth Onex kit sold by Sonex Aircraft, shipped on August 5, 2011. Sonex Aircraft is an American aircraft kit manufacturer located in Oshkosh, Wisconsin, producing kits for four all-metal homebuilt monoplanes. The company is led by John Monnett who has designed the Monnett Sonerai sport aircraft series, Monnett Monerai sailplane, Monnett Moni motorglider, and Monnett Monex racer. Monnett designs are displayed in the Steven F. Udvar-Hazy Center of the National Air and Space Museum near Washington D.C. The Onex (pronounced ?One-X?) is a single-seat aircraft designed to offer an even-more economical way to build and fly a sport pilot aircraft. The folding-wing design can fit into a garage, or share a T hangar with other aircraft, be trailered on local roads, and the wing panels are easily removed for trailering at highway speeds. The cockpit of Bill Fisher's Onex, featuring AeroConversions Throttle Quadrant and Pitch Trim System, MGL Avionics Stratomaster XTreme EFIS displays and MGL V10 Com radio. The Onex follows the Sonex Aircraft design and engineering tradition in offering a simple, robust, aerobatic aircraft capable of squeezing incredible performance out of lower powered engines. Like all other Sonex Aircraft, the Onex is designed for use with the AeroConversions AeroVee Engine. The simple, low cost, and technically advanced AeroVee Engine Kit is a perfect fit for the Onex, offering outstanding performance and economy. Sonex Aircraft is a leader in the experimental kit aircraft industry, providing a series of Sport Pilot eligible kit aircraft and producing the AeroConversions line of products which include the AeroVee engine, AeroInjector and ancillary aviation products. The Onex Complete Airframe Kit and Sub-Kits are the most advanced kits ever produced by Sonex Aircraft, offering more than ever before in pre-fabricated parts and matched-hole tooling. Staying true to the Sonex Aircraft mission of offering The Best Performance Per Dollar, Onex kit builders can get their aircraft flying for as little as $25,299. Sonex Aircraft?s Sonex, Waiex, and Onex sport planes, and the Xenos sport motorglider offer outstanding performance in an easy to build, easy to fly kit package that can be purchased and completed with full technical support at an unrivaled price. Sonex and AeroConversions product development is committed to providing simple, elegant and low-cost solutions for sport flying. Simply put, Sonex Aircraft and AeroConversions products provide the best performance per dollar.